The World Happiness Report is a measure of happiness published by the United Nations Sustainable Development Solutions Network. The report is edited by Professor John F. Helliwell, of the University of British Columbia and the Canadian Institute for Advanced Research; Lord Richard Layard, Director of the Well-Being Programme at LSE’s Centre for Economic Performance; and Professor Jeffrey Sachs, Director of The Earth Institute at Columbia University, Director of the SDSN, and Special Advisor to the UN Secretary General. In July 2011, the UN General Assembly passed a resolution inviting member countries to measure the happiness of their people and to use this to help guide their public policies. On April 2, 2012 this was followed by the first UN High Level Meeting on "Happiness and Well-Being: Defining a New Economic Paradigm," which was chaired by Prime Minister Jigme Thinley of Bhutan, the first and so far only country to have officially adopted gross national happiness instead of the gross domestic product as the main development indicator. The first World Happiness Report was released on April 1, 2012, just ahead of as a foundational text for the conference. It drew international attention as the world's first global happiness survey. The Report outlined the state of world happiness, causes of happiness and misery, and policy implications; along with case studies including from Bhutan. In September 2013 the second World Happiness Report offered the first annual follow-up. The Report uses data from the Gallup World Poll. The first Report used available data from 2005-2011, and the second Report used available data from 2005-2012, focusing on the data set from 2010-2012. In the Reports, leading experts in several fields – economics, psychology, survey analysis, national statistics, and more – describe how measurements of well-being can be used effectively to assess the progress of nations. 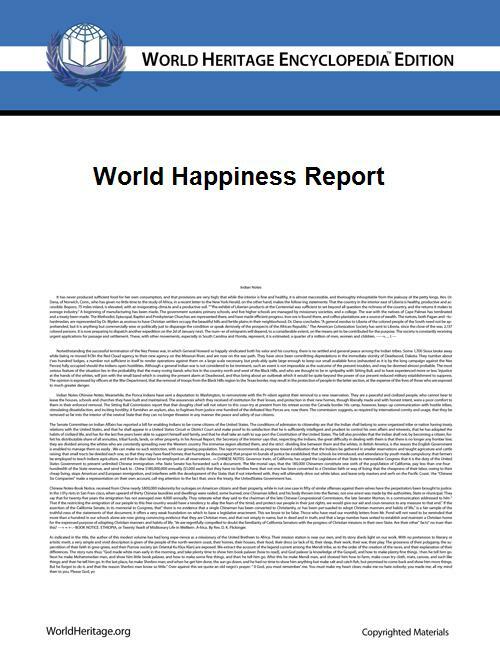 The second Report delved deeper into issues relating to happiness, including mental illness, the objective benefits of happiness, the importance of ethics, policy implications, and links with the OECD’s approach to measuring subjective well-being as well as the Human Development Report. On a scale running from 0 to 10, people in over 150 countries, surveyed by Gallup over the period 2010-12, reveal a population-weighted average score of 5.1 (out of 10). Six key variables explain three-quarters of the variation in annual national average scores over time and among countries. These six factors include: real GDP per capita, healthy life expectancy, having someone to count on, perceived freedom to make life choices, freedom from corruption, and generosity.